We continue with Kunitoshi by entering his Rai phase. As mentioned in the first part, Kunitoshi decided at a certain point in time to sign with the prefix “Rai.” I wrote that this might have been connected to his father’s death, i.e. in 1297 according to the Kotô Mei Zukushi Taizen, but I was going through known date signatures again and learned that there are actually two earlier ones known that are already signed with “Rai,” that is a tantô dated Shôô two (正応, 1289) and a tachi dated Shôô three (1290). So maybe this was the time Kuniyuki retired and handed over the forge to him or Kuniyuki actually did not die in 1297, as stated in the anyway partially doubtful Kotô Mei Zukushi Taizen, but in 1289. Anyway, I have edited the first part in this respect to make it work by itself and without the second part. So let’s start with the overlapping phase when Kunitoshi started to leave behind his magnificent tachi and started to follow the then trend to again somewhat more elegant blades with a more unobtrusive hamon. I am saying “started to” on purpose because we have to be careful. 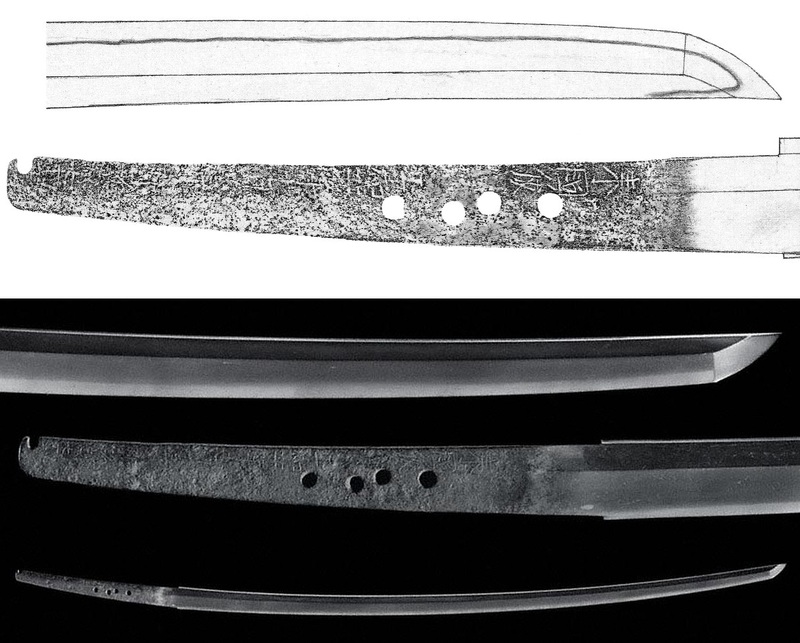 The aforementioned tachi dated Shôô three (1290) (see picture 7) is already pretty unobtrusive in terms of its hamon and also shows a noticeably more elegant sugata. 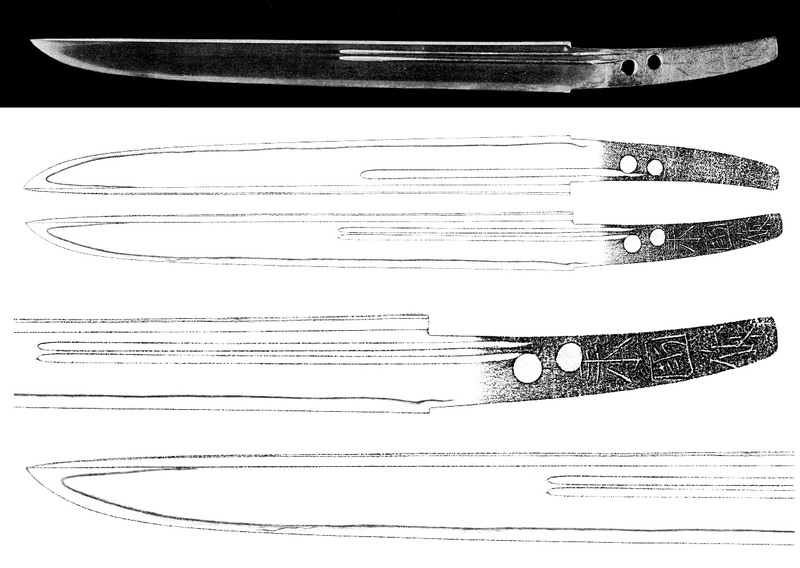 It is very similar to the late Niji blade shown in picture of of the last part and was made only twelve years after the magnificent and flamboyant dated work from 1278 (picture 2 in the last part). In short, he made such unobtrusive blades early on in his Rai phase and apart from that, he went back once in a while to a more flamboyant jiba in his latest years, although combining that deki with an elegant and slender sugata (more on this later). So it is not black and white and just styles A and B with a little transitional period. It is complicated, I know. The kodachi shown in picture 8 is dated to his early Rai phase and is as you can see pretty flamboyant. It has a somewhat narrow mihaba, a koshizori, shows funbari, and ends in a ko-kissaki. The kitae is a dense ko-itame with plenty of ji-nie and nie-utsuri and the hamon is, as mentioned, a flamboyant mix of chôji, ko-chôji, and ko-gunome in ko-nie-deki that is mixed with ashi, yô, fine kinsuji, and sunagashi. The nioiguchi is rather tight and despite of showing some prominent chôji elements with large yakigashira at the base, the ha itself doesn’t feature that many ups and downs. The bôshi is sugu with a ko-maru-kaeri and shows some hakikake. The mei of the kodachi shows characteristic features that dates it to the early Rai phase and which I will introduce at the end of this chapter. It is interesting that there seems to be a lack of dated works from his 60s and that they increase again in number from Shôwa two (正和, 1313) onwards, i.e. when he was 73 years old (or 74 if you follow the Japanese way of counting years). So let me finally introduce the famous blade that he signed with the supplement “at the age of 75” (see picture 9). It is designated as a jûyô-bunkazai and signed in kakukudashi manner “Rai Kunitoshi Shôwa yonnen jûgatsu nijûsannichi ?? sai nanajûgo” (来国俊正和二二年 十月廿三日◯◯歳七十五, “Rai Kunitoshi, 23rd day of the tenth month Shôwa four , ? ?, at the age of 75”). It has a normal to slender and tapering mihaba, a deep toriizori with funbari, and ends in a chû-kissaki. The kitae is a dense ko-itame with ji-nie, a nie-utsuri, and some Rai-hada. The hamon is a straightforward chû-suguha in ko-nie-deki with a rather tight and very bright nioiguchi that only features a few hataraki like ashi and yô. The bôshi is sugu and shows a long running back ko-maru-kaeri. Now I want to introduce a blade (see picture 10) that so to speak displays a style which is most representative for Rai Kunitoshi, or that comes to mind first when thinking of this smith. It is a jûyô-bunkazai tachi dated “Gen’ô gannen hachigatsu hi” (元応元年八月日, “a day in the eighth month Gen’ô one ”), once again in kakikudashi manner. It has an elegant sugata with a toriizori, a little funbari, and a chû-kissaki. The kitae is a dense ko-itame that stands a little out in places and the hamon is a ko-nie-laden suguha-chô that becomes a little wider along the monouchi and that undulates a little towards the base. The ha is mixed with ko-chôji, ko-gunome, sunagashi, muneyaki, and ashi which slant here and there. The nioiguchi is rather subdued and the bôshi is sugu with a long running back ko-maru-kaeri. As indicated, the interpretation in suguha-chô with ashi slanting towards the tang, muneyaki, and a kaeri that runs back in a long fashion is typical for Kunitoshi and the Rai School in general. As he was already 79 years old at the time this blade was made, it is assumed that we are facing here a daimei, most likely of Kunimitsu. The latest known date signature of Kunitoshi is from Genkô one (元享, 1321) and is found on the tachi shown in picture 11. He was already 81 years old at that time, therefore it is verly likely that this blade too was made by one of his students, probably Kunimitsu again. It is the work that I meant earlier with him returning once in a while to a more flamboyant jiba, but combined with a very elegant tachi-sugata. The blade is slender, tapers noticeably, has a toriizori, and a smallish ko-kissaki. The kitae is a very fine ko-itame with ji-nie, fine chikei, some jifu and antai, and a midare-utsuri. The hamon is a ko-nie-laden suguha-chô that is mixed with chôji, ko-chôji, ko-gunome, muneyaki, densely arranged ashi and yô, and fine kinsuji and sunagashi. The midare elements and the ashi slant in places (i.e. appear as Kyô-saka-ashi), the nioiguchi is bright, and the bôshi is sugu with a wide ko-maru-kaeri. This is once more a blade that is difficult to kantei. The sugata is highly elegant and might remind of late Heian and early Kamakura at a glance and with the midare-utsuri and the outstanding quality, one might think of Ko-Bizen masters like Masatsune (正恒) or Tomonari (友成). 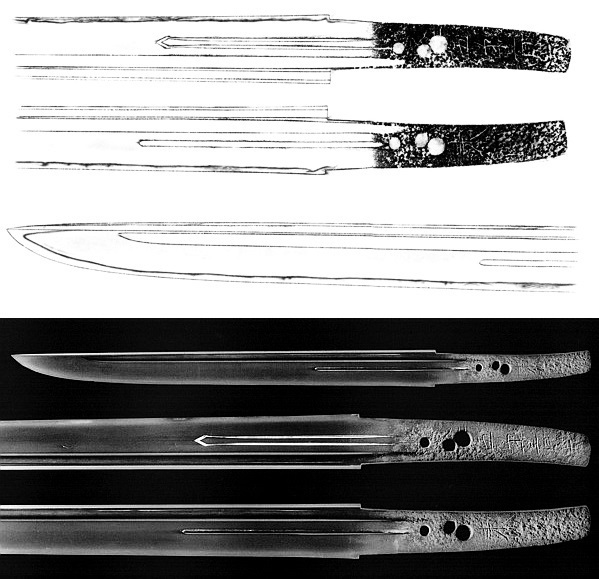 But their sugata would be different as they made blades with a pronounced koshizori that bends down towards the tip. The jigane says Rai and the ha Kuniyuki but the sugata is the important again why it can’t be him. He too did make such classical sugata with a smaller kissaki but usually in combination with a classical jiba. His more flamboyant jiba is usually found on more magnificent tachi that anticipate the strong mid-Kamakura sugata of Kunitoshi’s Niji phase. Apart from that, we would expect to see some karimata here and there on a Kuniyuki blade. Key here to nail it down to Rai Kunitoshi is the utsuri that appears as midare but with darker antai areas, a peculiarity that is sometimes seen at Kunitoshi in his later phase and at Ryôkai. But at Ryôkai, we would see some masame and shirake and his ha is a hint more subdued. Now to Rai Kunitoshi’s tantô. 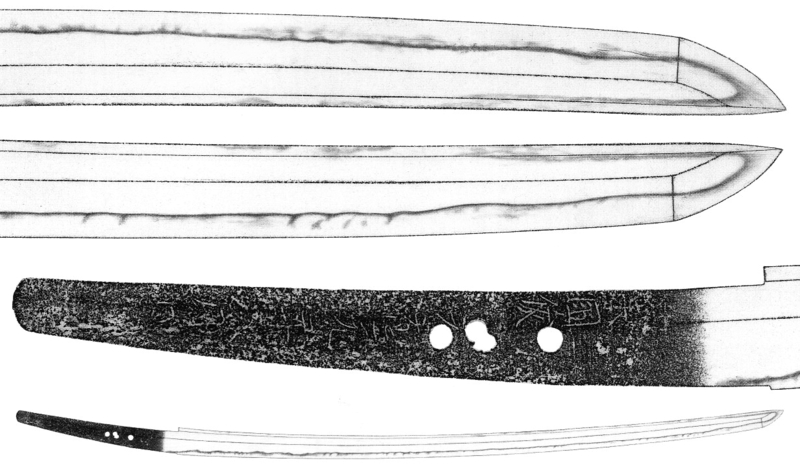 Like his senior Awataguchi colleagues Kuniyoshi and Yoshimitsu, he did not focus on one single tantô style and made blades with the very wide range of roughly 18 to 30 cm, although the majority lying somewhere between 21 and 24 cm. 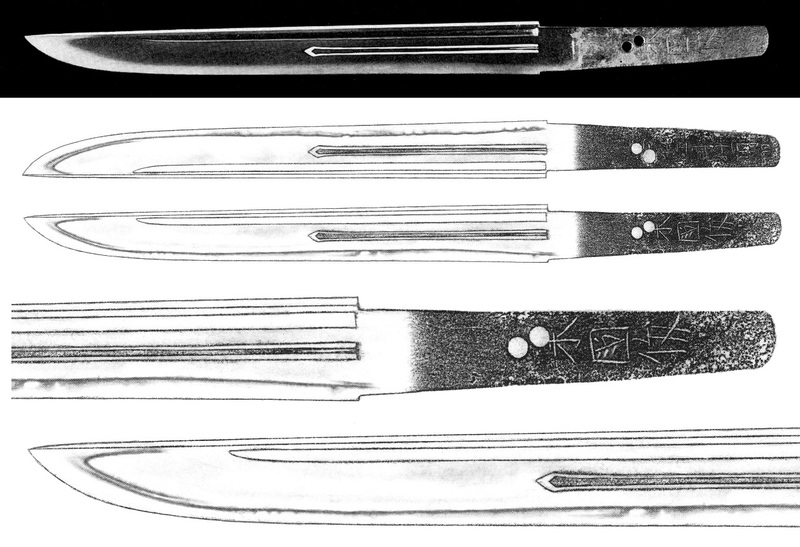 And he was also open for different blade geometries as he made apart from the standard hira-zukuri also shôbu and kanmuri-otoshi-zukuri tantô. So let me introduce a few representative works, beginning with the kokuhô that is owned by the Atsuta-jingû and that is thus also referred to as “Atsuta Rai Kunitoshi” (熱田来国俊). The blade is dated “Shôwa gonen jûichigatsu hi” (正和五年十一月日, “a day in the eleventh month Shôwa five ”) and is with a motohaba of 2.5 cm pretty wide for its nagasa of 25.1 cm. It shows an uchizori and a kitae in dense ko-itame with fine ji-nie. Interesting here, the nie-utsuri is joined by a thick bô-utsuri that appears parallel to the ha. The hamon is a ko-nie-laden suguha that is mixed with ko-ashi, ko-gunome, and a kuichigai-ba along the fukura that turns into a kind of nijûba. The nioiguchi is wide, bright, and clear and the bôshi features a ko-maru-kaeri which is noticeably longer on the omote than on the ura side and which Tanobe sensei describes as “Fuji shape.” He explains that this shape, which resembles a stylized Mt. Fuji, is a characteristic feature of Rai Kunitoshi and also seen on some tachi and that its “mountain peak” appearance is the result of a wide and long turnback that makes the kaeri look a little symmetrical. 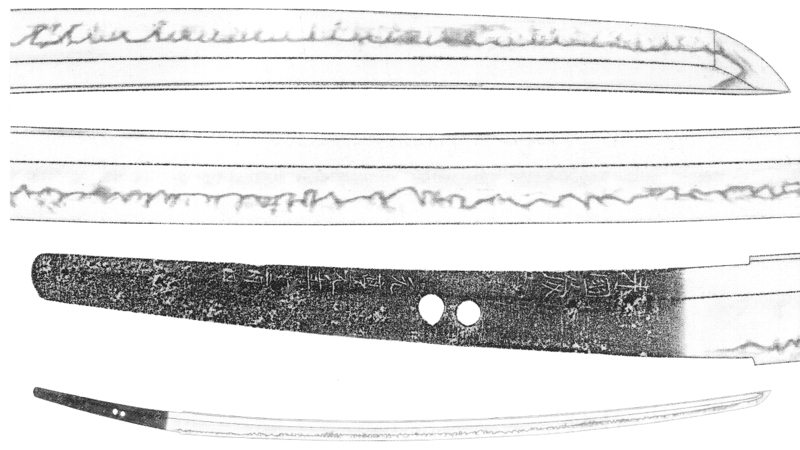 Both sides of this tantô show a katana-hi with a suken below which end at the same height in kakudome. The last tantô I want to introduce is a kokuhô and this blade is truly classical, also with its curved furisode-style nakago. It has a normal mihaba and nagasa, uchizori, and a relative thick kasane, so everything speaks for Kamakura. The kitae is a fine ko-itame with a little masame and displays ji-nie. The hamon is a chû-suguha in ko-nie-deki that is mixed with ko-ashi and some kinsuji along the monouchi. The nioiguchi is rather tight and the bôshi is sugu with a wide ko-maru-kaeri which results again in the aforementioned “Fuji shape,” this time the symmetrical slopes are pretty clear, especially on the omote side of the blade. The omote side bears gomabashi and the ura side a koshibi as horimono. When you go back to the Awataguchi chapters you will see that the grooves are a little farther away from the mune than for example at Kuniyoshi or Yoshimitsu. This, sometimes rather felt than measureable, distance from the mune is a characteristic feature that distinguishes Rai from Awataguchi tantô. At the end of the chapter on Kunitoshi, I want to address the changes in his signatures but with a focus on the basic changes. During his Niji phase, he signed the three inner left short strokes of the character for “Kuni” pushed up to the upper left corner. He kept that when he started to sign with the prefix Rai but gradually stretched them out and distributed them evenly over the height of the character. Apart from that, the outer box of the character fof “Kuni” got more angular and a little smaller over time and the ending strokes/sweeps of the character for “toshi” were given up in his advanced Rai phase. Another important feature of Kunitoshi’s mei is that he executed the upper part of the character for “Rai” as just three parallel horizontal strokes. The angle of the inner left short three strokes of the character for “Kuni” changes during the Shôwa era, that means they are now no longer slanting from bottom left to top right but from top right to bottom left. But at post-Shôwa mei, i.e. from Bunpô, Gen’ô, and Genkô, the previous variant is seen again. Comparative studies of Rai signatures allow us certain conclusions about daimei. First of all, it seems as if the daimei artists producing for Kunitoshi in his latest years took over the master’s way of signing the name of the school, Rai, and combined that with their own variant for “Kuni.” For example, Rai Kunitsugu signed the inner left short three strokes just like seen on the Kunitoshi works from the Shôwa era, i.e. slanting from top left to bottom right. Therefore it is assumed that all Kunitoshi blades signed that way go back to the hand of Kunitugu (see picture 16 left). Rai Kunimitsu in turn signed the three strokes in a quite steep manner, similar to what we see on Gen’ô and Genkô dated blades. Thus it is said that all these blades go back to the hand of Kunimitsu (see picture 16 right).